Buy men's shirts and apparel at wholesale prices. Customizable men's short sleeve tees, from Anvil, Fruit of The Loom, Jerzees. Custom men's long sleeve tee shirts from Jerzees, Anvil, Hanes, and Augusta. Custom Men's tees from Jerzees and Gildan. Add your logo or promotional art. 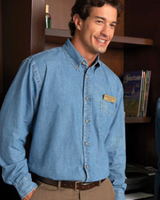 Blank denim shirts are popular for customizing with promotional logos. We carry long sleeved and short sleeved denim shirts as well as a cotton camo shirt.